If you’ve been paying close attention to our social media lately, you’ll know that we love the Totem Wolf brand. Their professionally crafted beard oils, and other beardcare products, have been keeping our beards bushy, bright and beautiful for a while now. 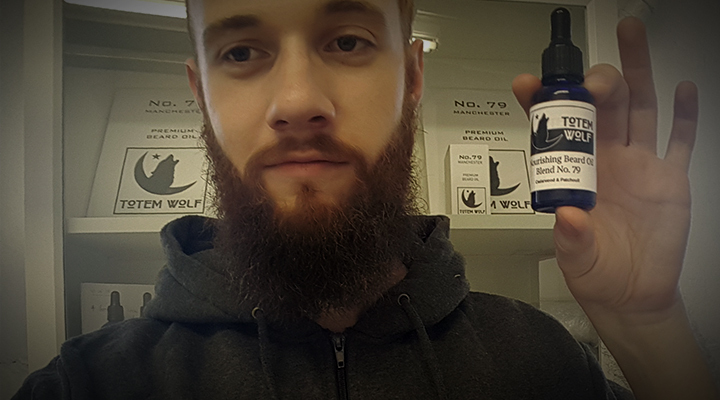 I’ve been lucky enough to sample a few of the lovely beardcare concoctions at Totem Wolf HQ, they were even kind enough to get Bristlr to Pride! But let’s talk about Blend 79 (as seen in GQ Magazine) and why you should get in to it. Check at the end of this article for a store link! When the scent first hits you, you’ll be greeted with the sweet yet minty top notes of Grapefruit and Peppermint. These scents are great mood boosters, and combined are great to help with depression, colds and even headaches. The oils are also antibacterial and antiseptic, so no nastiness in your beard! And those are just the top notes! It doesn’t stop there. Shortly after the initial application, as the top notes begin to fade, it’s time for the heart notes to kick in! A strong combination of Rosemary and Clary Sage. If you’re feeling a bit run down, the Rosemary is a great mind booster. It’s a fresh, minty scent with a woody undertone (for that touch of masculinity, if that’s what you’re after). The Clary Sage mixes well, with a sweet, nutty scent that calms and helps with stress. A little while longer and the base notes of Cedarwood and Patchouli Dark come out. The Cedarwood, as the name suggests, is a very woody scent, with a touch of warmth. What’s that? Perfect for the winter? Perfect Christmas present for your bearded buddies? Yeah, that’s what I thought you said. More mind clearing scents to follow with the Patchouli Dark oil, which is deliciously sweet and rich, with added earthy tones. So, how would I describe Totem Wolf’s Blend 79? Well, it’s definitely a journey of a scent. It’s a complexly sweet scent, that evolves whilst it’s on your beard! Who doesn’t want a dynamic scented beard? I know I do! 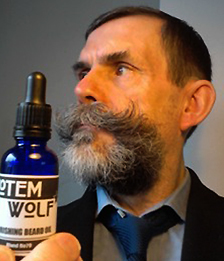 Speaking from experience, I can tell you that Totem Wolf beard oil’s are worth every penny. You get a lot for your money, not just in quantity (the bottles last a long time) but also quality. Each bottle is delicately blended with care and attention to detail. They also look super classy. What’s that? You want your own bottle? Or thinking it would make a great present for your beardy pal this Christmas (Winter is coming, just sayin’)? Get Blend 79 here! 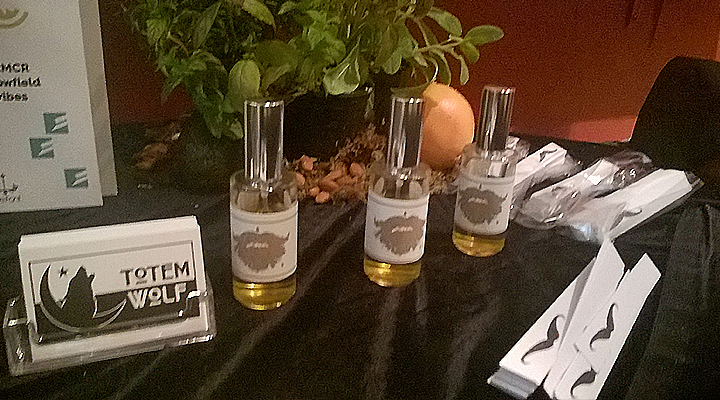 Last week I was delighted to hear the Bristlr team had been invited to Totem Wolf’s Premium Beard Oil Launch. I couldn’t have said yes faster. I left with a specially selected cake, my very own bespoke blend of beard oil and full of cheer (in part courtesy of the beautifully blended, beard oil inspired gin cocktails). 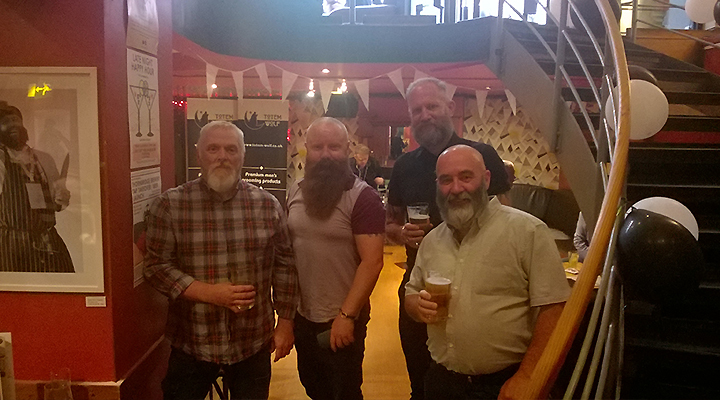 Take a look at all these beautiful beards! And that’s only a handful of them! With a lovely welcome from Totem Wolf’s founder, Philip and a warm, fuzzy and friendly atmosphere, a great time was had by all! Over 100 samples of Blend 79, the latest scent by Totem Wolf, were given away. No one left empty handed! And did I mention the gin cocktails? The Font Manchester created two cocktails, with ingredients found in Totem Wolf’s oils, specifically for the night. It might sound a little odd, drinking beard oil cocktails, but I couldn’t get enough of them! The party may be over, but the gifts are still coming! Head over to Totem Wolf’s website before the 16th of June to get 25% the new Blend 79! The Bristlr beard gang would like to send a huge thank you to Totem Wolf for the great party and the generous gifts! We look forward to enjoying more of your beard oil blends. Thanks from your friends at Bristlr! Free samples of a new, very masculine and nourishing beard oil, are up for grabs! Blend No. 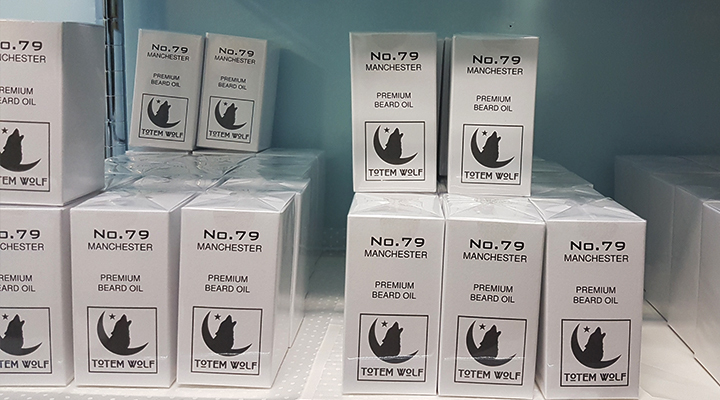 79, is a fresh citrus woody fragrance, which is being launched by Totem Wolf (Manchester’s artisnal premium beard oil company) to the lucky first 100, at a very special launch party, on 9th June at The Font Manchester. Expect FREE drinks & exclusive designed cocktails created just for the night. There will be giveaways, a photo-booth and your chance to become the “Face of Totem Wolf 2016” offering some great prizes. Launching at the same time, will be a specially commissioned exhibition of bearded men called “Shine”, by an up and coming photographer, Beth Rubery. If you have a beard, like men with beards, or you just love a good excuse for a party this is the night for you. So Manchester beard owners and fans! Come on down to the launch tomorrow evening at The Font, Manchester!